The very moment that I fired up 20XX, I was met with a rather familiar homage to one of gaming’s most famous title screen opening sequences. The one where the camera pans vertically up a tall skyscraper, only to find the lead character standing at the top, ready and raring to go. If this particular scene rings any bells to you, then you already know which game heavily inspires this Kickstarter-backed project. If not, then it seems that 2018 is certainly a good a year to find out. For those who are still unaware, the reference is, of course, to Mega Man 2. However, 20XX leans more closely to the Mega Man X saga in regards to style and gameplay. In any case, back in 2013, game director Chris King saw motive in rekindling the spirit of the series, due to the long absence and growing demand for Capcom’s own Maverick Hunter. Despite seeing an initial release on other platforms last year, developer Batterystaple Games has decided to launch 20XX on the Nintendo Switch mere weeks before Mega Man X Legacy Collection 1 & 2 arrive. This may seem a somewhat suicidal, or possibly even genius, decision depending on your anticipation level or interest in the upcoming Capcom-owned series. After all, who doesn’t want more Mega Man? Or even an appetiser in the spirit of the classic franchise? The good news is that 20XX is not necessarily the carbon copy that you may expect it to be. 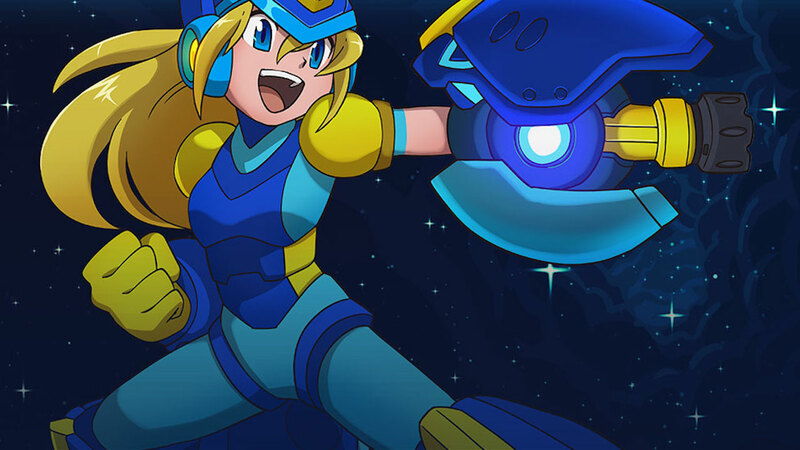 It is, in fact, a Mega Man X-inspired roguelike adventure, where you take the helm of one of two characters – a female lead called Nina who closely resembles the Blue Bomber, and a sword-wielding Zero clone called Ace. There isn’t much of a story to go by here other than what’s briefly hinted in tiny snippets. From what I can gather, the city, or maybe the world even, has been invaded by a mechanical enemy force and it’s up to the two teenage prototype battle bots to save humanity. The duo is overlooked by two scientists who analyse your progress to see whether or not you are up to the test. Should you happen to fail, they’re more than happy to simply terminate the heroes with a push of a button. This leads you into procedurally generated environments where you blast, slash, dash and wall jump your way to the boss doors, where the end of level guardian awaits. The control system in place is all very familiar, yet stays very tight and satisfyingly responsive as I could have possibly hoped for. As this is a rogue-like, each run provides the possibility to earn many different upgrade combinations and perks that will give you more power than Donald Trump sat in front of the red button. Many of these upgrades are temporarily fixed to every playthrough, while others can be obtained permanently by collecting spirit tokens to spend in the main central hub. The central hub itself is the place where you can venture on to the main path, swap characters, embark on weekly and daily challenges, purchase goodies and gander at the online leaderboards. It acts more as an interesting interactive menu system of sorts providing you with everything you need in one room, including a local co-op and online multiplayer option. The multiplayer feature is where dreams come true in 20XX. You and a buddy can work together to try and eliminate all the bosses within each run in a way that has only ever been a pipe dream in the core Mega Man series. The feature has been implemented very well here too, with no collision detection between buddies and a camera that will zoom way out to cater for both characters on the same screen, regardless of how far apart you are. Sure, it can get a little difficult to keep up with your character amongst the platforms and enemies when drawn so far away, but I would rather that than constantly warping one player back to the other. You can warp to your buddy’s location if you wish, by holding down the emoji-style item communication button – a useful feature that is left to your own choice should you decide to skip a platform section that your ally has already conquered. What else is neat is how your friend can also embark on the challenges with you to add a bit of extra support. Providing a teamwork attempt to have your name plastered across the leaderboards. The daily challenges in place can only be entered once every 24 hours, while the weekly events can be mastered until they are updated every Wednesday. There’s more difficult variants of each, plus a seeded level generator with a code to jot down for replayability. If that isn’t enough, there’s also added gameplay modifiers to amp up the intensity. The game does do a great job at keeping it approachable for less skilled players too. The main 20XX mode has three difficulty settings with the easier option allowing you to run and gun with three lives instead of the one credit that the normal and hard difficulties provide. As for the harder difficulty? That too allows you to implement Halo-style skull modifiers should you accept nothing less than a brutal challenge. When all tied together, 20XX makes for a highly competent Mega Man-esque experience. The roguelike elements keep the gameplay interesting due to the number of new combinations and skills that you can acquire. The procedurally generated level layout tends to keep platforming diverse for the most part, although with only a handful of different level design styles it can start to look a bit too familiar in places. It does look nice overall though, even with it containing a graphic style that I’m personally not usually too fond of. It has that puppet animated flash game look to it, a style that funnily enough resembles the Mega Man X remake found on the mobile App Store. While the animations on that particular port looked very odd and out of place, here they are fast and fluid enough for it to look and move in a more visually appealing manner. 20XX is a game that is well worth its value. It is a fine entry point to ease you into the core Mega Man universe, and a fun space filler for those who are waiting in anticipation for the Mega Man X Legacy Collection. I do realise that I have banged on about the similarities between this game and the franchise that heavily influences it quite a lot in this review. However, that seems to be the point and ambition of the game in the first place – to hold the reins when no one else can control the carriage. Yet 20XX does far more than to simply be a blatant Mega Man clone. It is a combination of “what ifs” and “why nots” that makes this particular title a great little game in its own right. With plenty of modes, tons of upgrades, an in-depth record of your statistics and, most importantly, fun gameplay, 20XX certainly deserves a place next to Capcom’s mascot in the library of your Nintendo Switch.